A king and his daughter's kingdom is under heavy attack. The king does his best to save his daughter, but fails. An airship somehow beams her up into the ship and then flies away, leaving the old king to his doom. Only one guy can save her and that guy is... Sparkster! Sparkster is an opossum creature with blue shining armor with a jetpack mounted on the back of the armor. He also has a sword, which he can increase the power in by holding the attack-button. 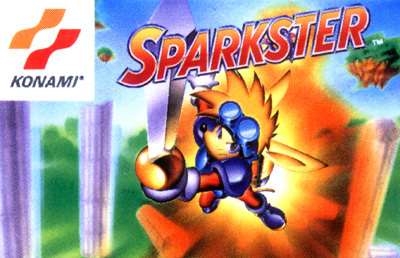 Doing so will start up the jetpack and make Sparkster fly for a short period of time in the direction he is pointing with his sword.